After a great deal of dashing about trying to find a suitable place at the Rugby club for us to shoot after they double booked us again, we eventually set up on the far field, with a entry of 18 people to cater for. 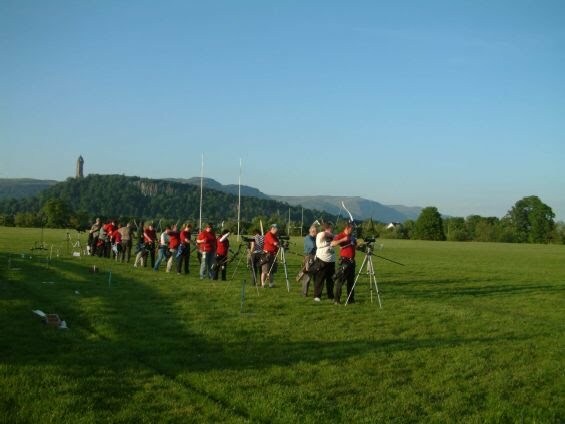 It was a super evening – very warm and sunny and no breeze, and it served as a very good introduction to competition for the many new folk from Cupar Bowmen that came along to have a go. The competition itself was good humoured and very easy going, with George M kindly stepping into the breach at the last minute to act as Field Captain (although we all think he needs a bit more practice with his whistle !). We were very lucky that the weather was so good, as it was still bright enough at 10.00pm to look for missing arrows in the long grass.